Now it is very easy to download all of your saved search history for Google searches. It gives you access to your data whenever required. You can keep a local data search base in your system. Open your Web & App Activity page. Click the Options icon on top right corner and then > Download. Once the download is over, an email confirmation with a link to the data will be sent to your email address. Please make a note here that if you download all your past searches then it will not be deleted from your Web & App Activity page. If you want to delete your searches and browsing activity then click here. Where is your downloaded data saved? 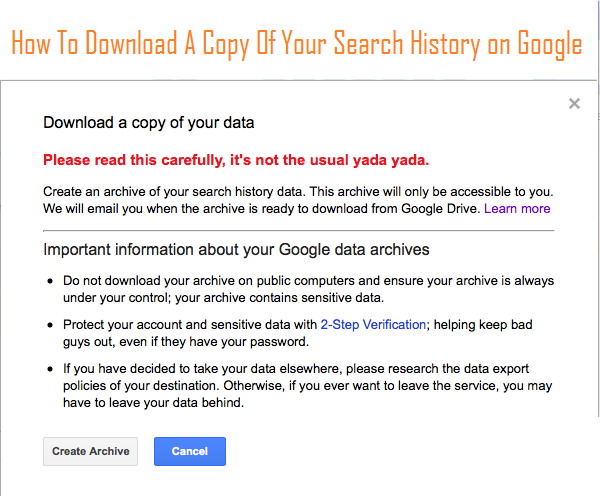 once you complete downloading your past searches, a copy of your history will be saved securely to the Takeout folder in Google Drive. Select the file you'd like to download. In case you are selecting multiple files then hold down Shift or Ctrl (Command on a Mac) while clicking on multiple files. Right click on the files and select Download. Depending on the amount of data you’re downloading, you may be have more than one file in your Takeout folder with your history in it. Never download your past searches on public computers as this can be misused by anyone. Always protect your account and sensitive data with 2-Step Verification. This will restrict others to keep out of your account even if they have your password.